Reprinted with permission from The Gourdzette: Official Newsletter of the Gourd Crafting Community. Several people have asked how to attach the strap, latch and hinges to a gourd purse so I will try to explain how I do it. There are so many ways to put the purse together and attach everything that I will group 3 different methods that work well. You may also wish to see Crafting with Gourds for more information. Leather—– The hinge latch and strap attachments are all leather. Cut a rectangle piece of leather about 2-3 inches long and 1.5 inches high . Punch holes in the four corners (6 works better for larger hinge)Cut the gourd lid where you want it and tape it back to the gourd with masking tape. Line up the leather rectangle on the back of the purse so that it is centered on the cut you made for the lid. Mark the holes you punched in the leather onto the gourd and drill the holes straight through the back of the purse. Use 4 or 6 of the type screws shown to attach the leather hinge to the purse. This leather hinge can be stained to match the finish you put on the purse. Next drill 2 holes on each side of the gourd [where the strap will attach] about 5/8 inch below the rim of the bottom part of the purse (not the lid). Attach the strap with leather strips by tying it through the hole in the gourd and holes that you punch in the end of the strap (fold the end of the strap over to get a double thickness before punching the strap). Next [for the closure strap], drill 2 holes in the front of the lid 5/8″ to 3/4″ above the rim of the lid (see photos).Loop [the ends of a] leather strip through these holes and tie a knot in the doubled ends. 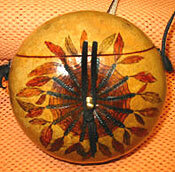 Attach the brass (or silver) button stem (see picture above left) in the center front of the bottom part of the purse. Adjust the knot so that you get a snug fit when the lid is closed and you are finished. Metal hinges– See pictures for placement of the hinges. Some wood working talent is needed here to Route or carve a notch for the hinge to fit flush. Be very careful to line up the lid and bottom so that the lid closes properly. Next drill the holes for the strap and latch the same as you would for the first method (leather strips) but use the screws shown in the pictures to attach the strap and latch to the purse. This method is more complicated and works best with the thicker gourds. Snap latch- This can only be used with a very thin gourd because the snap stems are short. Be very careful when crimping the snap that you don’t break the gourd.